Group Exhibition Of Drawings And Paintings is an event that took place between 06-May-2006 and 17-May-2006 in Hyderabad. There's an array of fine work waiting to be appraised by the Hyderabadi art connoisseur. Shrishti Art Gallery displays 17 outstanding artists including Ashok Mullick, Chippa Sudhakar, D L N Reddy, Laxma Goud and Gogi Saroj Pal. The preview of these artworks will take place on the 6th of May. The exhibition will be on view from the 7th of May. 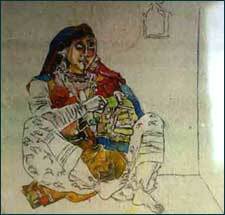 Revered art historian Jagdish Mittal, accompanied by the artists, will inaugurate the exhibition. Please contact 2354-0023/2360-7151 for further details. Be the first to comment on Group Exhibition Of Drawings And Paintings! Just use the simple form below. fullhyd.com has 700,000+ monthly visits. Tell Hyderabad what you feel about Group Exhibition Of Drawings And Paintings!